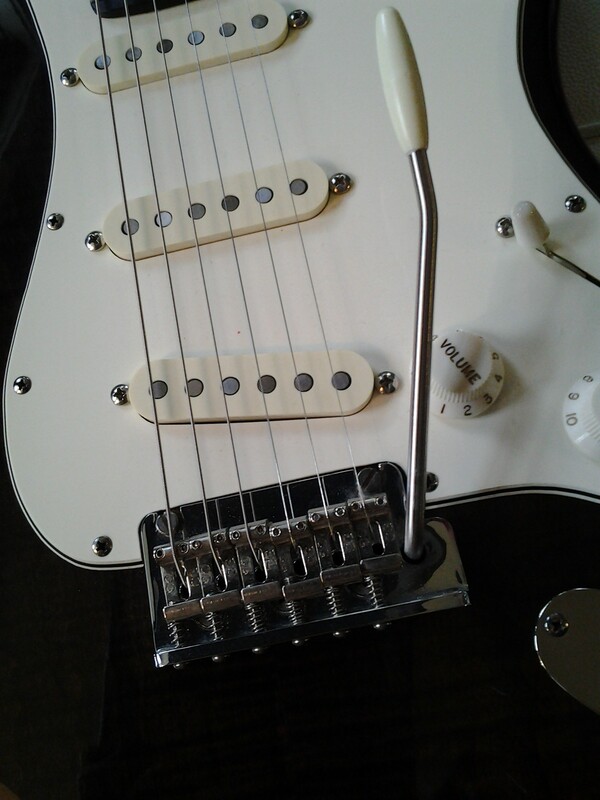 1991 Fender Stratocaster Ultra, denatured. This is the electric guitar I bought in 1991. I was impressed by how it played, but I didn’t know myself well enough to understand why it was the wrong guitar for me. It really was. It may be the biggest reason I fell out of playing. It was designed, I think, to compete with what companies like Paul Reed Smith and Charvel were doing at the time. It has a roller nut, a tremsetter, locking tuners, and a 12″ ebony board on a medium C maple neck. Fender added a showy maple cap and back to the traditional alder body as well. The black burst helps to keep that aesthetic excess in check, sort of. To top it off, they loaded it with a versatile but oddly configured set of Lace Sensors (S/S/Dually) with some extra switches. Very super. I know now that I find lace sensors sterile, but I didn’t know that then. It was, anyhow, uninspiring. I didn’t really know why, since it was clearly a very nice guitar, but I tried to sell it for a year when I needed money in grad school. I wanted too much for it, probably because I didn’t know better and certainly because I needed money for grad school, and so it didn’t sell. And then it just seemed wrong to sell it. 20 years. 25. After working on a couple of Squiers, I had a much better idea how to make it inspiring. I ordered a pickguard loaded with a set of dirty blondes from Lollar (they used to do that). They wired it so that the back tone knob controls just the bridge pickup, which is a good idea. I also got myself a new block and saddles from Bill Callaham. Billy Brockman put it together, and pretty well insisted on sticking to GHS 10s instead of the 11s I usually play. He was right. Billy has a way with a strat. All of that made it a fun guitar. 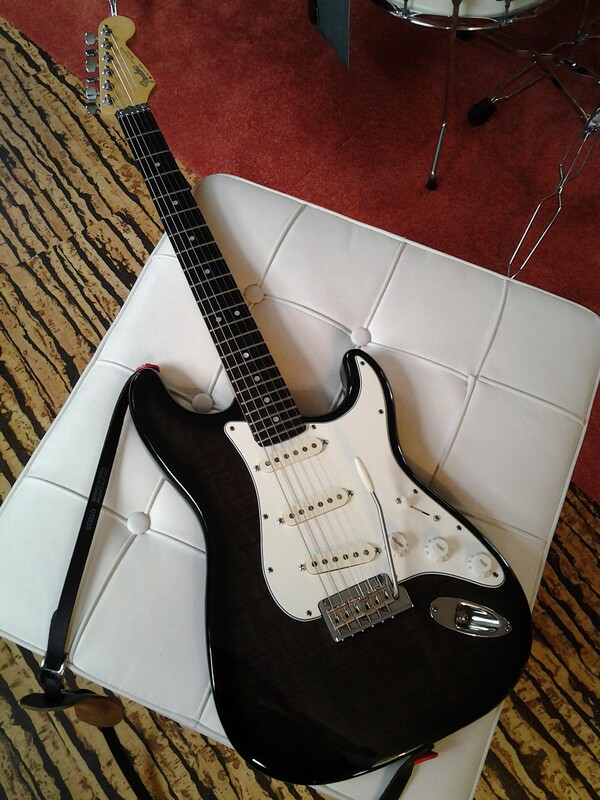 It’s my only strat, and I’d have to sell it if I got another, but that would feel wrong. Strats just aren’t my thing, as terrific as they really are. When I play it, I always think of Mitch Easter playing Big Star. Turns out I didn’t sell it when I got another strat. I did learn how to make strats suit me better. This one is now blessed with 10-44.5s from thegts.co to suit the goofy roller nut and 5 low tension springs (goodbye, tremsetter) from rawvintage.com to make the trem feel more like a Bigsby and give the guitar a thicker sound. I still think of Mitch Easter. A few years ago, my wife wanted to buy me something fun. Birthday gifts, she said, shouldn’t have to be practical. I gave in and let her buy me a Gretsch 5122 at the dearly departed Charlottesville Music. I had a twenty year old strat and a Glen Campbell Ovation that I hadn’t played much for years, but buying that Gretsch got me playing again. I sold my old solid state amp and got the AC30 I’d always wanted but that was too loud and wouldn’t stick. I found an ’85 Rickenbacker to replace the one I’d sold back in the early 90’s. It made the Gretsch seem shabby, so I traded it in for a Country Gentleman, which was beautiful. I bought a Squier Custom II Tele for the p90s but thought it could sound better. Turns out it could.